When it comes to weddings, you can never completely trust the weather in western Washington State, but if you want your best chance at getting a dry, warm, sunny wedding day, August is the month to pick. Didn't matter for this bride and groom's wedding at Orting Manor in Orting, Washington. It rained all day, and by the end of the reception, the bride's dress was filthy, everyone was damp, and the wedding venue had a swimming pool. 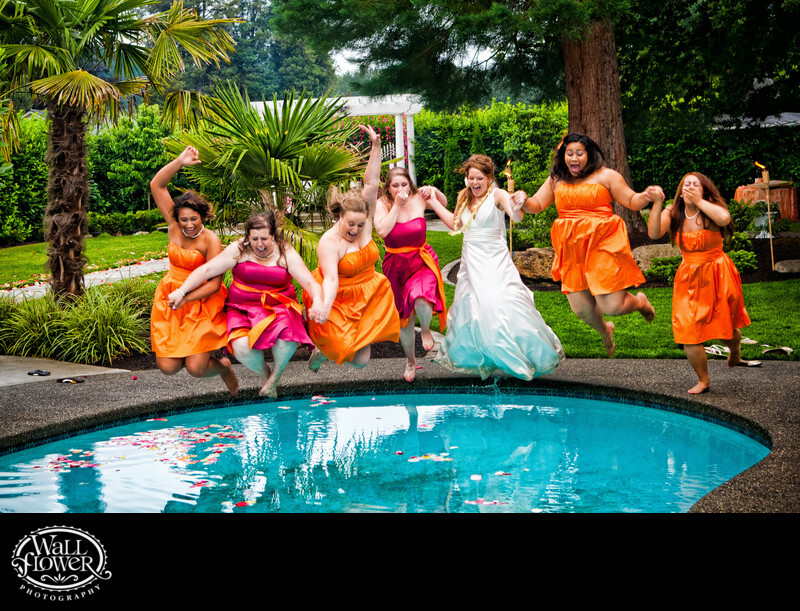 One thing led to another, and before we knew it, we were shooting the bride and her six bridesmaids jumping into the pool! We got all sorts of fun photos of the girls swimming in their dresses, and a bit later some of the groomsmen joined them in the pool. This photo won an award in a wedding photography contest held by the Wedding Photojournalist Association (WPJA). There's also a great photo of this bride in a little round hot tub in the Created gallery.